Education was important to the Ahn family. Susan Ahn Cuddy attended college in Southern California, and would be both a good student and an active athlete. But even though she met the qualifications: a college graduate with some work experience, she was turned down by the recruiting officer when she first attempted to enlist as a WAVE officer in 1942. When the Navy program opened up for the women, I was gung-ho. I was in San Diego and I came up to Los Angeles and tried to be part of it, but it was an officer’s training group and I didn’t make it. Well, I mean it was known that it was because I was Asian and not acceptable. A woman who knew Ahn intervened, and she was later accepted as an enlisted WAVE. 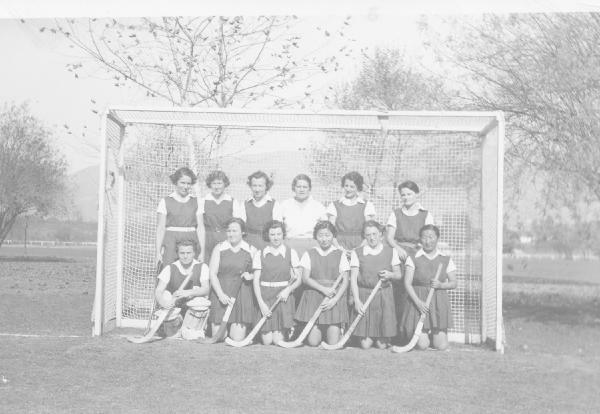 This photograph is of Susan Ahn’s college field hockey team: she is in the front row, fourth from left. It comes from the collection of Susan Ahn Cuddy and the Island Mountain Trading Co.